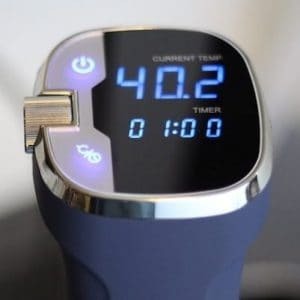 The Kitchen Gizmo Sous Vide KG-SV1 is a better than average quality sous vide, that's easy to use and has the features most people are looking for. $64.95 Current Price - YOU SAVE $38.58 - This is the lowest price for this item. The Kitchen Gizmo Sous Vide KG-SV1 is a better than average quality sous vide precision cooker, that has most features the home cook is going to want. The wattage is lower than average but the above average flow rate compensates for it. This model is a great choice but for a little more money you can make a dramatic step up in quality and functionality. The Kitchen Gizmo Sous Vide is $64.95 , our second highest rated model the Wancle Sous Vide SVC001 for $87.99 which we feel is a much better overall value. This model is 17" in height It has a high impact polycarbonate housing and a stainless steel tube housing for the heating unit. It has an alligator style clamp, which is easy to set-up and cleanup and put away, but it doesn't off a lot of flexibility for vertical adjustment.Overall this was a solid well put together precision cooker. The Kitchen Gizmo Sous Vide KG-SV1 is good unit that is both high quality and easy to use, it will fill the needs of home chefs. For just slightly more money you can get our second highest rated model the Wancle Sous Vide SVC001 which is a much better value. 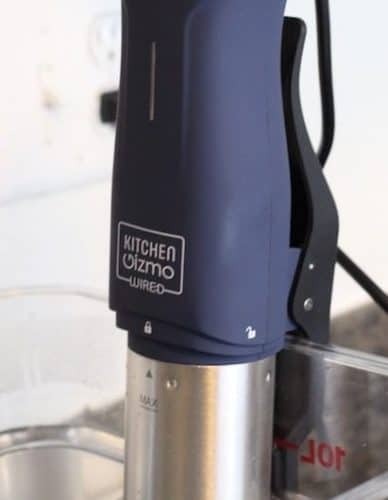 17" x 3.5" x 3.5" 11.1" x 14.8" x 4.5" 16" x 3.5" x 3.5"
The Kitchen Gizmo Sous Vide KG-SV1 combines quality, ease of use, and most popular features at a very reasonable price, making it a good choice for most people.